For this week’s Best Free iPad App of the Week, look no further than the TED app for iPad. For those among you who are already familiar with TED, it needs no introduction. For those who aren’t, sit back, relax and be prepared to discover inspiration. Under the banner of Ideas worth spreading TED (Technology Entertainment Design) is the name given to a set of annual conferences, aimed to bring together the top of the field of various fields – science, business, entertainment, culture, to name a few – to share insights, learnings and ideas. Originally only those in the conference audience were privileged to gain from the lectures. Then from 2006 onward, TED talks were made available online for free for the general public, with much success. This week an important milestone was announced, TED videos have been viewed over 500 million times. In 5 years. If you’ve taken the time to view a TED talk you know that they are thought provoking, inspiring, funny and memorable. There are hundreds and hundreds of videos to choose from, on a variety of interesting topics: medicine, magic, education, beauty, aging, leadership, you name it – whatever interests you. You can and will lose a lot of time watching videos, some over and over again. 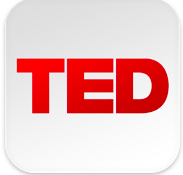 TED talks can be viewed on the web, on iPhone and on iPad. Of course the larger iPad screen is a more comfortable viewing experience. The app itself opens with a grid of featured videos. Tap on one to see more details, click to play and view. You can also tap on the “Inspire Me” button in the bottom left, to choose a kind of talk (among the options: courageous, funny, beautiful fascinating), choose the length of time you have at your disposal and get a list of suggestions. Otherwise, just use the navigation bar at the bottom to see all themes, tags or your saved talks, which allow you to store talks for offline viewing. When you’re finished, you can share on Twitter, Facebook or by email. There’s not much more to say here than hurry up and download this free App for your iPad (iTunes link for the universal app). It will be worth your while. Note that for non English people like me, an unofficial app is also available: TED + SUBtitles.